I’ve been mulling over something for the past couple of years,something that directly affects anything I write for this blog: how do I balance the intrinsic merits of a work of art with my own personal reaction to said work? This is a thorny matter. We all have preferences, right? Ketchup versus mustard, cats versus dogs, movement-heavy dance versus more theatrically-based works. Contemporary choreography versus story ballets. As I write this, I note my use of that word “versus.” This isn’t a contest, there’s no right or wrong. I’ve set up a false dichotomy. Nevertheless, I sometimes struggle to separate my aesthetic preferences from a truly open response to art I see, and art I write about here. Given that I post what I write for potential (albeit minimal) public consumption, I wonder whether I have to hold myself to a higher bar? I think the answer is yes, particularly if I’m holding the art to a similar high standard. If you’ve read anything I post, you probably know I have an affinity for choreography that challenges dancers to bring a high level of technical training; for work that brings a cogent beginning, middle and end (harder than it sounds); for dancers who reveal their authentic selves in their performances. I like art that has something to say but doesn’t hit me over the head with a message. I yearn for work that I think about for days afterwards. 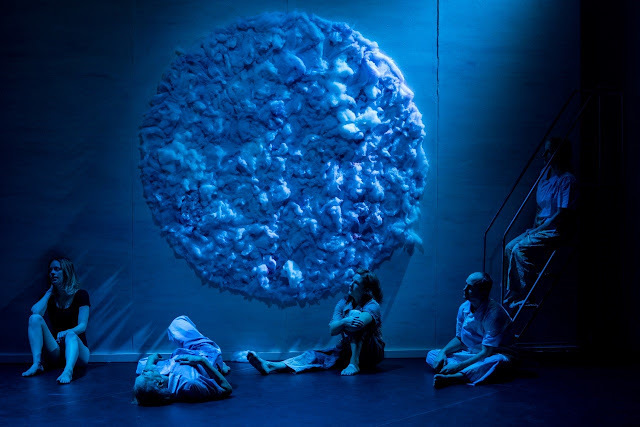 This is an incredibly long preamble to some short thoughts about Peggy Piacenza’s recent evening-length piece, ‘The Event,’ produced at Base in Georgetown in mid-October, a performance that I've been mulling over for a couple of weeks. 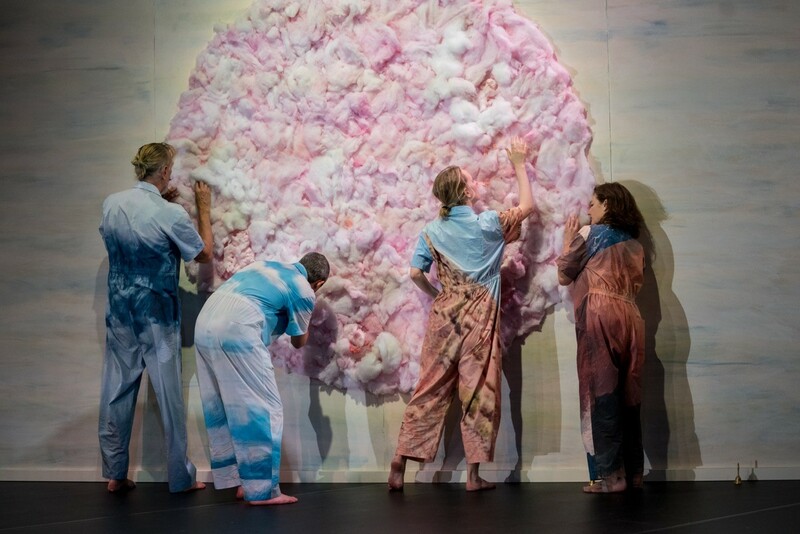 This multi-media work featured four exceptional dancers (Ezra Dickinson, Kim Lusk, Wade Madsen and Amelia Reeber) in addition to Piacenza, some evocative videos, and a fabulous cloud-like wall partially constructed of cotton candy. 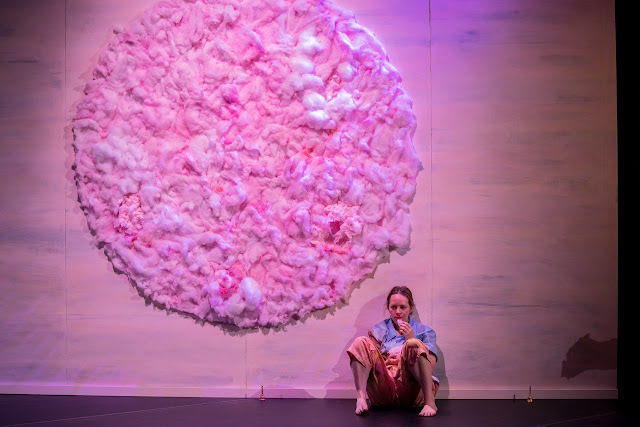 From the first video of Lusk and Reeber blowing cotton balls across a smooth surface at one another, to images of dandelions gone to seed, to Lusk pulling a hank of cotton from the wall and stuffing it into her mouth, Piacenza strives to remind us of the ephemeral nature of our lives and our world. Kim Lusk consumes part of the set of 'The Event.' Not something you see every day! Even the use of hand bells emphasized this for me. In one beautiful section, each dancer held a small bell in each hand, ringing them in a meticulously choreographed set of patterns. The sweet soprano peals overlapped, ultimately fading away in the small space. ‘The Event’ is packed with strong sections like that: Lusk and Dickinson perform a duet in perfect synch; Madsen and Dickinson lie on the floor, making snow angels; Piacenza stands on a ladder watching the other dancers as they repeat almost ritualistic hand movements. So many beautiful moments, like beads threaded onto a necklace. I hope Piacenza gets to revisit this work, because to me the beads on that strand were out of order. Somehow, the final bead had been swapped with another and the ending had been placed within the body of the work. When 'The Event' ended, I was left feeling a little muddled, rather than with a sense of having watched a clear arc that reached an understandable conclusion. And that’s where my personal aesthetic preferences come in; many others in the audience loved the ambiguity of the ending. They preferred it, in fact, to a more traditional ‘story’ arc. And who am I to tell an artist that she should be creating a piece that speaks more to me than to these other audience members? Frankly, I am always in awe of any artist who has the confidence and the persistence to realize her vision in public. Our community (our world!) is richer for this creativity, and this courage. Peggy Piacenza literally put her heart into this work, and I admire what she has achieved. So, dear artists, now you know some of my own biases, some of what gnaws on me after every show I see. I figure I’ll just keep watching and writing and trying to make sense of your work, for myself and anyone else who wants to follow my thoughts. All the artists puts in a lot of efforts behind their master piece, which mostly people are unable to understand. it's good to see you're making an effort to link the dots! It's a Pite-A-Palooza in Seattle!